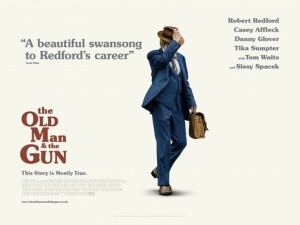 It’s all that anyone ever seems to talk about when discussing Robert Redford’s latest movie The Old Man & The Gun, so much so that Redford has even said he regrets mentioning it in the first place, but this is due to be his final movie before retiring from acting altogether. For many, it is a bittersweet fact; the actor has charmed his way into audiences’ hearts for over fifty years with films like Butch Cassidy and the Sundance Kid, All The President’s Men, Out of Africa and The Horse Whisperer, and to see him finally throw in the towel is certainly sad to witness, especially when he’s clearly still got that acting spark burning within him. However, if the 82-year-old actor truly has had enough of performing, then he’s more than entitled to spending the rest of his days doing whatever he feels like, because he’s certainly left enough of a mark on the industry that he doesn’t need to prove anything else to anyone. Mercifully, he’s chosen a great movie to go out on; The Old Man & The Gun, which sees him reunite with writer-director David Lowery after taking a supporting role in the filmmaker’s recent version of Pete’s Dragon, is a perfect vehicle for Redford that has him putting his natural charisma to fantastic use, reminding us one final time that Redford truly is an actor for the ages. Based mostly on a true story, Redford plays Forrest Tucker, a career criminal who has spent most of his life in jail, and has previously made sixteen successful escapes. After the sixteenth such event in 1981, he teams up with a group of other elderly criminals (played by Danny Glover and Tom Waits in small but by no means wasted roles) to calmly commit a series of bank robberies, and doing so with extreme politeness and pure gentlemanliness. Even though they’ve got the cops on their tail, including beleaguered detective John Hunt (Casey Affleck, in his third collaboration with Lowery after Ain’t Them Bodies Saints and A Ghost Story), Forrest and his pals never let their optimism and general happiness with their craft slide, especially when Forrest strikes up a sweet relationship with widowed farmhand Jewel (Sissy Spacek). Robert Redford truly is the star of this picture, not just from giving a seriously great performance that ranks among his very best in recent years, but also from turning his charm and likeability up to eleven that really makes you want to fall in love with this guy, no matter what gender or sexuality you are. He simply oozes charisma as this guy, who’s clearly found something that he loves doing and makes him happy, despite its obvious illegalities, but he does it in such a polite and charming manner that everyone can’t help but admire him for his manners. At one point, while he’s with a bank teller who’s crying because it’s her first day, he’s quick to cheer her up and tell her that she’s doing a great job so far – even though he’s the one that’s forcing her to hand over the money. Outside of his bank robbing, he spreads his optimism to everyone around him, including his criminal associates in scenes where they’re just sitting and reminiscing about old memories (an entire sequence is just of Tom Waits telling a funny story that ends with him saying why he doesn’t like Christmas), and Sissy Spacek who he shares fantastic chemistry with and is also great on her own terms here. Seriously, the little quips and one-liners he shares with her makes me feel like I want to marry this guy, and I’m not even gay in the slightest; that’s how powerful Robert Redford’s charm is in this, and it’s a more than fitting curtain bow to a screen legend that reminds us all here as to why he became legendary in the first place. The movie as a whole is a lot of fun, and very entertainingly constructed and executed by David Lowery, who’s a filmmaker that seems to easily switch between experimental films – which is a category that Ain’t Them Bodies Saints and A Ghost Story certainly fall under – and audience-friendly fare, which is a description that Pete’s Dragon and now The Old Man & The Gun definitely match. He and cinematographer Joe Anderson give this film the look of a grainy, shot-on-film aesthetic that makes it feel like it came directly out of the late 70s or early 80s, while he and editor Lisa Zeno Churgin lend it a gentle, mellow pace that allows you to soak in all the details of this enjoyable folk story, including the sub-plot that sees Affleck’s cop go on a nice little arc where he goes from wanting to catch this guy to truly respecting his way of life, which fits well into the overall narrative in the movie, even though its one downside is that it prevents us from showing Redford on screen some more. You can tell that this filmmaker is so passionate about this story and this main character, because he injects the same amount of niceties and genuine warmth that Forrest Tucker exhumes into the very nature of the film itself, if only to make sure that the film as a whole represents the raw and even inspiring personality of a friendly guy who just happens to rob banks. It’s an easy, undemanding watch that you’re bound to have plenty of fun with, whether it’s just watching Redford and his friends just relax and be their natural selves, or admiring the soulful and passionate filmmaking that has gone into this real treat of a movie. But once again, it comes as a sobering reminder that Redford does intend for this to be his final acting role, after years of delighting audiences as the true movie star that he is. Whether or not he’ll stay retired is anyone’s guess, because if his performance in The Old Man & The Gun is anything to go by, he’s still got that fire burning deep within him, and it doesn’t look to be going out anytime soon. The Old Man & The Gun is an extremely pleasing and very well-made crowd-pleaser that serves as a fantastic platform to showcase the amazing and endlessly charismatic talents of a retiring Robert Redford.